Posted by grhomeboy in Greek Culture, Greek Culture Heritage. Carnival seems to be the perfect excuse for mass indulgence. Adhering to the codes of organised religion can certainly be tough, but that’s why some clever Italians back in the 1500s decided it was a good idea to hold wild parades just before the rigours of Lent set in. Then the rest of the Christian world felt that it was a brilliant idea to indulge in more food and drink than one can possibly handle, as glitzy costumes and musical performances gave humans a reason to rejoice in their faith of God. Sounds quite bizzare doesn’t it? Interestingly, what first began as a festivity deeply rooted in pagan tradition slowly morphed into a worldwide fascination for getting dressed up or dressed down and a brilliant money-making occasion for clothes and accessory retailers who finally have an excuse to get rid of their most ridiculous attire. Today, even Japan holds its own version of Latin Carnival as Tokyo’s Asakusa district comes to life with dancing girls, fabulous costumes and salsa sounds. They certainly aren’t preparing to say farewell to meat, but they can’t resist the temptation for a wild party. Here in Cyprus, we may not be able to enjoy all the pizzazz that characterises the streets of Rio, but we still love to celebrate the occasion. As the invites for dress-up parties and dinners come through, it’s time to riffle through the wardrobe to find ‘the other you’ for the night. Whether you opt for the killer gangster look, a 1920s Broadway babe or a character from Star Wars, it’s all about daring to be someone different. While festivities are organised across the island, Limassol is the real centre of activity. 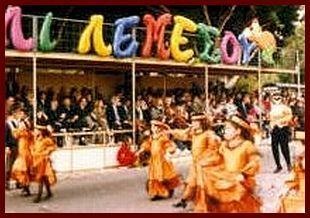 The fun begun on Thursday 28th February, Tsiknopempti in Greek, with a children’s parade down Pentadromos and Anexartisias Street. On Friday you had the chance to learn more about the history of the Limassol Carnival with a talk by journalist, Titos Kolotas, followed by a film screening on the whole occasion. Donkeys decked up in colourful gear, while the crowds sung and danced down village lanes, were some of the hallmarks of traditional carnival. On Tuesday evening, the Limassol Municipality invites everyone to go along to the Medieval Castle Square in full costume where there will be lots of carnival merrymaking, music and dancing. Put on your best frock and prepare for a carnival costume competition with awards for the best three. All the festivities will culminate in the Grand Festival Parade taking place this coming Sunday. You can expect the usual colourful procession down Archbishop Makarios III Avenue with the King of Carnival, giant papier-meche figures on floats, dancers in humorous and bizarre costumes, and a great deal of music by the Limassol Municipality Band. It’s all wonderfully cheesy and terribly tacky but carnival just wouldn’t be the same if it was any other way. The festivities will end with fireworks at the Medieval Castle Square. If you’re looking for something a little different to all the customary celebrations around town, a touch of Latin fever is coming your way. Go along to the Patticheon Municipal Theatre in Limassol this Wednesday and you’ll get to watch Son Cubano in all their glory, as they jet in from Cuba to bring the true festive spirit to our shores. Led by the well-known Cuban singer, Rene Maceo, the six band members are all graduates of the Havana Conservatorium, but were born and raised with the traditional music that fills the streets in the city centre. What better way to celebrate carnival than with a full Cuban band churning out a mixture of salsa, rumba and mambo? March 2 > Children’s Carnival Parade > Pentadromos-Anexartisias Street, 11.30am. March 3 > History of Limassol Carnival > Lecture by journalist, Titos Kolotas, and screening of Limassol Carnival documentary. Panikos Mavrelis Cultural Centre, 71 Eirinis Street. Free. Tel 25 341572. March 4 > Carnival Fiesta > Costume party with music and dancing. Medieval Castle Square. 8.30pm. March 5 > Son Cubano > Live music by Cuban band led by the well known Rene Maceo and his company. Patticheon Municipal Theatre. 8.30pm. €20.50. Tel 25 878744. March 9 > Grand Limassol Parade > Parade down Archbishop Makarios III Avenue. Starts 1.30pm, with a farewell carnival fiesta and fireworks at 8.30pm, Medieval Castle Square. Programme is subject to unexpected changes, especially for outdoor events. General info > call 25 342153 or 25 745919. King Carnival made a grand entrance with a colourful and festive display in Limassol, marking the beginning of Carnival festivities. Limassol Mayor Andreas Christou said this year there would be a revival of the King Carnival, who entered the town at 7pm last Thursday. There are new additions to this year’s carnival, such as three exhibitions, performances by the Cuban band “Son Cubanos”, three satirical floats from the Greek town of Patra as well as five gala balls on different days. The children’s carnival parade was held on Sunday, March 2, while the highlight of the festive season will be the grand Carnival parade on Sunday, March 9. 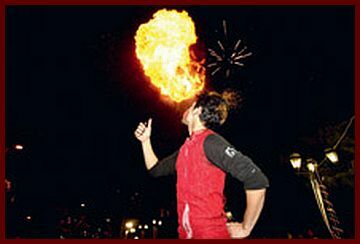 A performer breathes fire as fireworks go off as part of the Carnival celebrations in Moschato, southern Athens, yesterday. Thousands of adults and children wearing fancy-dress costumes joined parades around Athens and other Greek cities yesterday to mark the penultimate Sunday of the Carnival season. Moschato holds Athens’s biggest parade but the main attraction of the festivities is the parade in Patras, which will be held next Sunday to mark the end of the Carnival season. Thousands of telecommunications-related complaints are being filed each year by consumers, both with the General Secretariat for Consumers (GSC) and consumer organizations. In some cases, such complaints may be as many as for products and banking services, which occupy top places in the list. According to EU Commissioner for Consumer Protection Meglena Kuneva, who recently visited Greece, it is not the charges that make subscribers unhappy but the quality of services offered by telephony providers. Delays in service provision and incomplete information provided to consumers are at the top of the complaints lists. In 2007 alone, the GSC’s complaints phone line 1520 received more than 3,000 calls, accounting for 5.1 percent of the overall number of complaints filed for goods and services. The Development Ministry’s Agency said that the majority of such complaints related to contract effect dates, failure to provide the agreed services, reneging on the contract, inadequate network coverage and overly high and questionable charges. Development Ministry officials say an increasing number of consumer complaints have been made on telecommunications issues in recent years. This is attributed primarily to a new consumer mentality according to which there is a widespread hope that things in certain areas may be improved if complaints are made. Consumer Association EKPOIZO has said that in 2007 it received more than 3,200 complaints for telecoms, an area of service which now ranks in third place in terms of number of complaints, behind goods and banking services. Complaints have been made involving the following issues: delays in service provision and inadequate fulfillment of contract obligations; false information on line availability and time required for connection; lengthy waiting periods for connection, ranging from one to six months; lower-than-advertised Internet quality and speed, periodic line failures, low communication quality; billing of charges even when services are not being provided, and charges even after exiting a subscribed service; poor, if any, after-sales service, with waiting time at call centers reaching up to one hour; extremely high charges incurred by Internet users from so-called dialers, by global and even Greek-based companies. The association believes that such dysfunctions are the result of specific market shortcomings, including the way problems are dealt with by both the Hellenic Telecommunications Organization (OTE) and alternative telephony providers. In many cases, alternative phone companies deny liability for failure to provide services they have promised and agreed to, blaming OTE instead. In addition, EKPOIZO apportions part of the blame to state agencies GSC and the National Telecommunications and Post Commission (EETT), saying they are too «soft» and must take measures to effectively protect consumers. 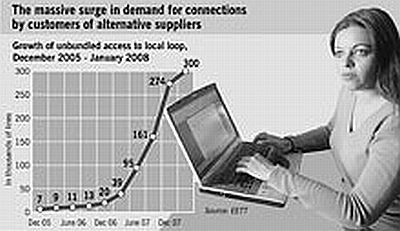 A similar picture is also drawn by the Consumer Protection Center (KEPKA), whose 2007 data showed a year-on-year increase of 84 percent in complaints for telecoms services, from 938 in 2006 to 1,728 in 2007. The center has demanded that an Obligations Charter be set up to protect consumers and their rights. A message by telecoms market officials that «the worst is behind us,» holds out some hope of a gradual improvement in telecoms services. Against this background EETT, as the agency where all consumer complaints end up, is also now more optimistic. «Based on our experience, we believe that the number of consumer complaints is gradually dropping, but to show this we need more concrete data, which we are likely to have next summer,» said Nikos Koulouris, Vice President of EETT. He admits though that all parties involved must handle certain issues very seriously. The Commission is soon to join forces with the GSC, the Consumer Ombudsman and the Ministry of Transport and Communications, to set up a «one-stop shop» website to help consumers solve a variety of related problems. The website will include details such as the names of officials to contact to speed up the process. On the other hand, alternative telephony providers have also made some tragic mistakes. For instance, they promised services and solutions which they knew they were unable to eventually provide. According to EETT, some alternative phone companies insist on referring customer complaints of service failures to OTE. Alternative phone companies currently provide voice and Internet connection services to some 800,000 subscribers across the country. Posted by grhomeboy in Baseball Handball Volleyball. Panathinaikos won the Greek volleyball cup for the second consecutive season, the fifth in the team’s history, with a 3-1 win over EA Patras on Saturday night. The cup triumph secures Panathinaikos a berth in next season’s Champions League. “This was my first title in Greece with Panathinaikos and I am pleased that we have secured our entry to the next Champions League,” said coach Mauro Berruto, whose team is already through to the quarterfinals this season. Panathinaikos lost the cup final’s first set 25-21 but rebounded powerfully to demolish any chance of an upset result. The Athens club went on to win the next three sets 25-16, 25-18 and 25-17. The volleyball cup final win was the first for Panathinaikos in all its sporting divisions this season, the historic Athens club’s centennial year. Panathinaikos salvaged a 1-1 draw away to AEK last night thanks to an equalizer midway through the second half from Helder Postiga that maintained the Greens’ narrow one-point lead in the battle for the Super League soccer title. Panathinaikos leads the standings with 50 points after 22 games and with eight remaining. Olympiakos, held to a 1-1 draw by visiting Asteras Tripolis on Saturday, lies a point behind. AEK is third with 46 points. AEK took the lead in the 67th minute when Rivaldo converted a penalty that was strongly disputed by the Panathinaikos team. The visitors equalized 11 minutes later for the final 1-1 score. Olympiakos, preparing to face English powerhouse Chelsea in London this Wednesday night following a scoreless draw in their Champions League Round of 16 first leg, took an early lead against visiting Asteras Tripolis with a fine header from Julio Cesar in the third minute of play. But Asteras, playing in the top division for the first time in its 77-year history, and placed fifth, struck back in the 33rd minute when Argentinean midfielder Horacio Cardozo exploited a misunderstanding in the Olympiakos defense to send in a low drive from the edge of the box. Olympiakos striker Lomana LuaLua will miss the London clash after sustaining a shoulder injury, which, according to reports yesterday, is likely to sideline him for the season’s remainder. LuaLua joins key midfielder Luciano Galletti on the Piraeus team’s injury list. But coach Takis Lemonis expects Greece international Vassilis Torosidis to be fit again for Wednesday night. Also Saturday, last-placed Ergotelis beat visiting PAOK 2-0. In other games, all played yesterday, it was: Levadiakos-OFI, 0-3; Xanthi-Panionios, 1-2; Apollon Kalamaria-Veria, 1-0; Larissa-Iraklis, 1-0; Aris-Atromitos, 2-0. Two men have been arrested in Thessaloniki on suspicion of trying to sell an illegally excavated Roman period statue thought to be of significant archaeological value, police said on Saturday. The 1.15-meter statue was found in a trailer that was parked near the city’s airport. Archaeologists told police that the artifact is an important find and would fetch a lot of money if sold, though no specific amount has been made public. Police believe the statue was being kept in the trailer while the two suspects, aged 57 and 50, negotiated its sale to an, as yet, unidentified buyer. Officers found several other artifacts when they searched the home of the 50-year-old.